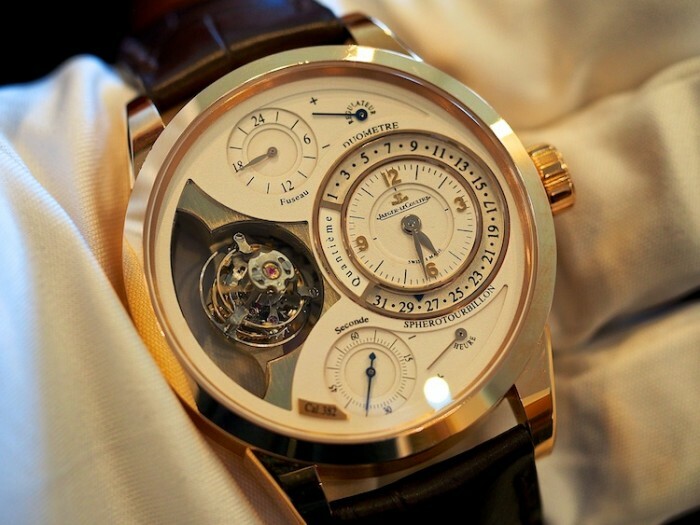 Jaeger LeCoultre first introduced the Gyrotourbillon 3 at the 2013 Salon International de la Haute Horlogerie (SIHH) last January, but the official introduction of the watch to journalists from the United States took place just last week, at the manufacture’s home in Le Sentier. 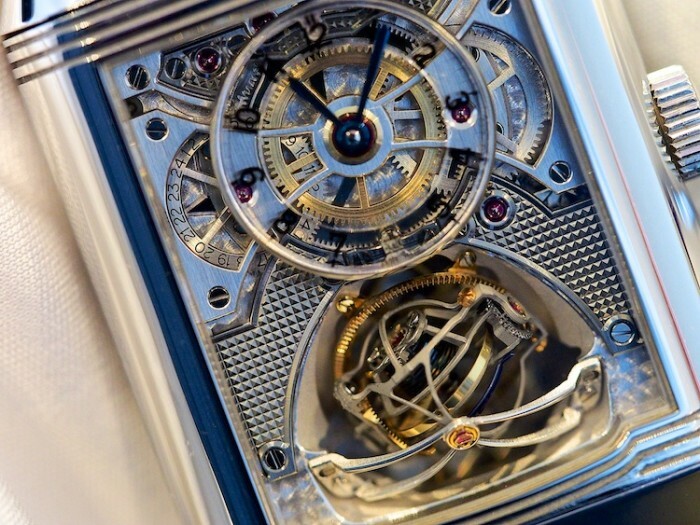 The home of Jaeger LeCoultre has grown enormously since 1833 (the year from which it dates its birth) and the creation of a watch like the Gyrotourbillon 3 –a unique, double axis flying spherical tourbillon watch with a digital chronograph –brings together technical skills that span the entire 180 year history of the firm. 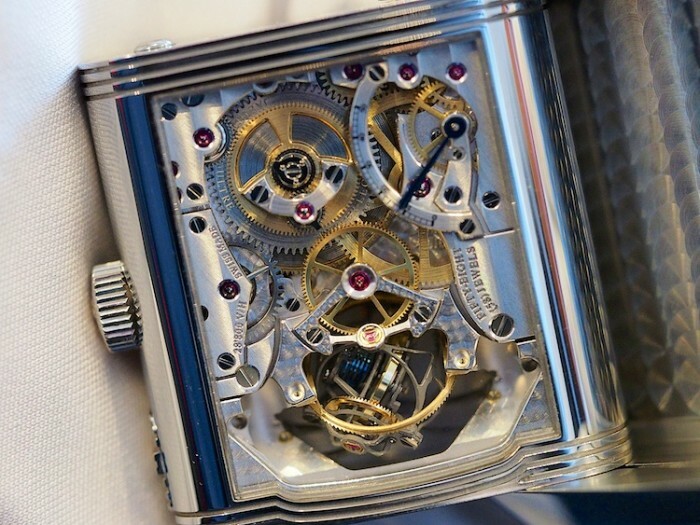 The Gyrotourbillon 3 is part of the Hybris Mechanica collection and previous Gyrotourbillon watches include the Gyrotourbillon 2 Reverso, as well as the dizzying Spherotourbillon. 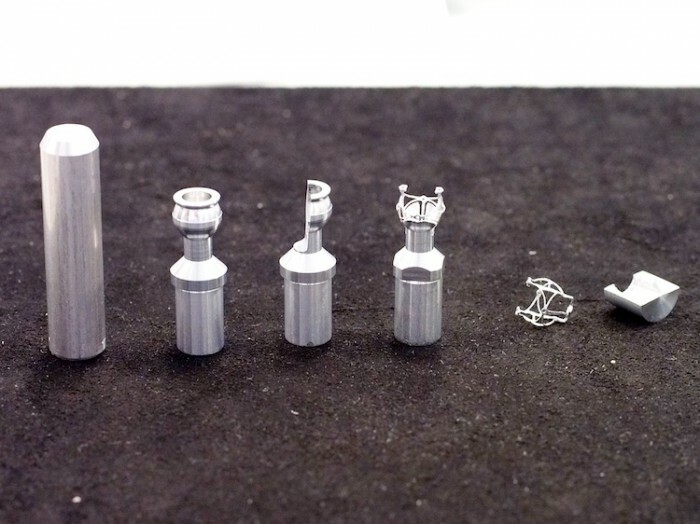 During the development process a variety of images and models are created before the first working prototype is made. 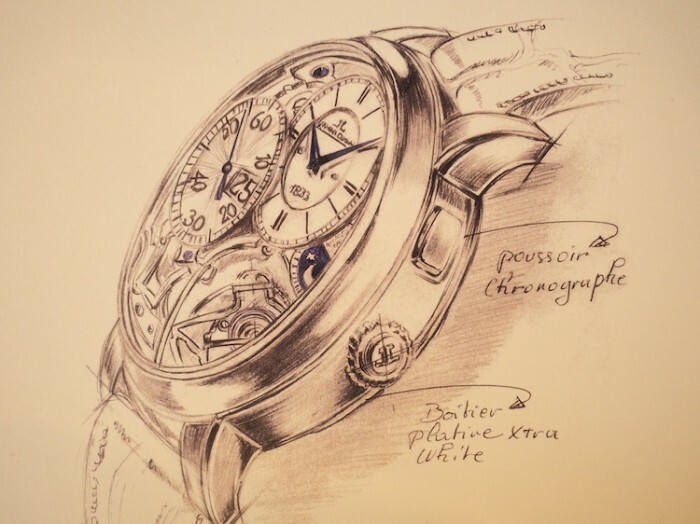 Everything from resin models with printed dials, to hand-made pencil drawings, to complex 3D CAD renderings are made to give as comprehensive a flavor of the watch as possible before the very costly process of making the first prototype is under way. The computer power necessary is considerable. 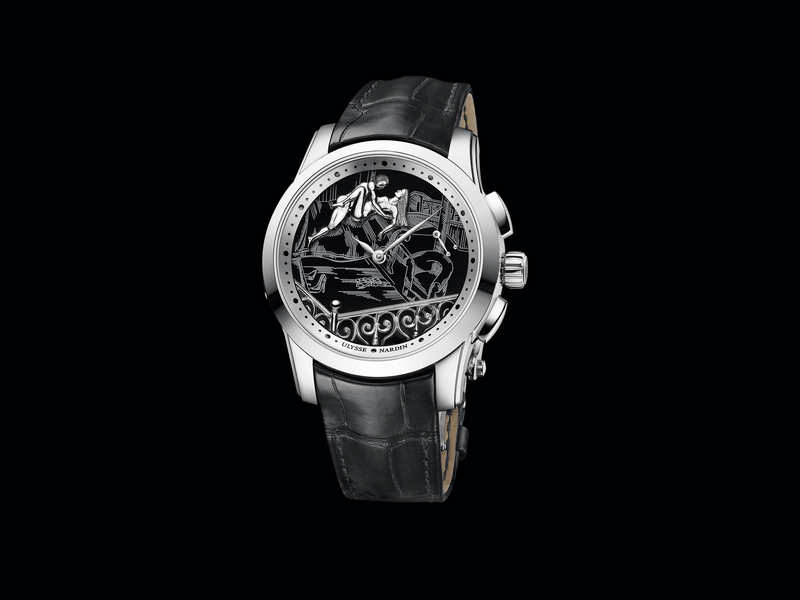 The gentleman in charge of creating full 3D renderings of the entire watch uses a program borrowed from the film industry (Keyshot) and the workload of rendering an image is spread across multiple workstations running 8 core processors at 3.6 gigahertz but it still takes many hours to create a single rendering, and when one is being produced it can slow down the entire R&D department, so the renderings are often created overnight. The program accurately renders a variety of textures and materials, right down to the reflection of parts in other parts. Once the design is finalized, a full working prototype is made in a dedicated prototyping studio separate from the rest of the factory. 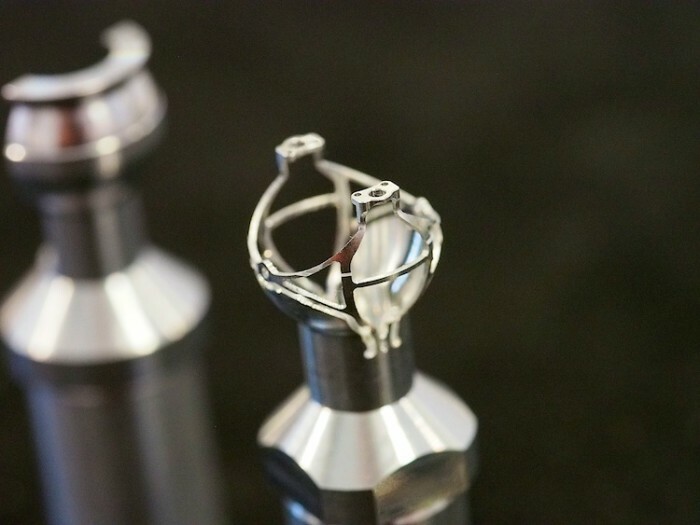 The prototyping studio has a complete suite of machine tools but also orders in parts from elsewhere in the manufactory as necessary. 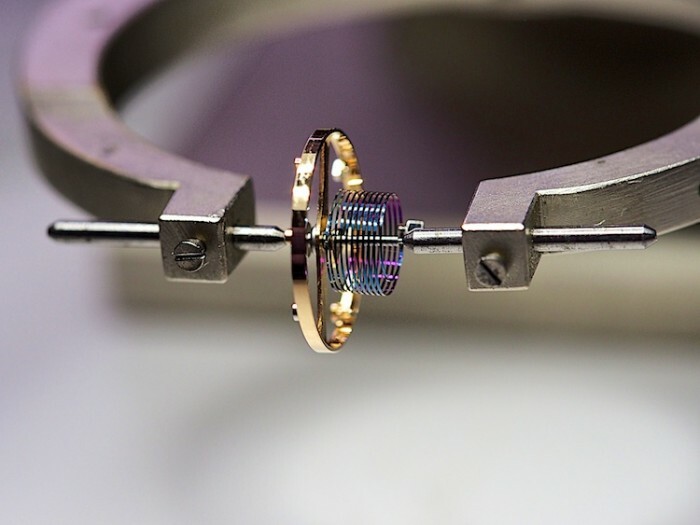 Though no part of the creation of such a watch is a matter of course, some operations are especially critical and one such operation is making the tourbillon cages. 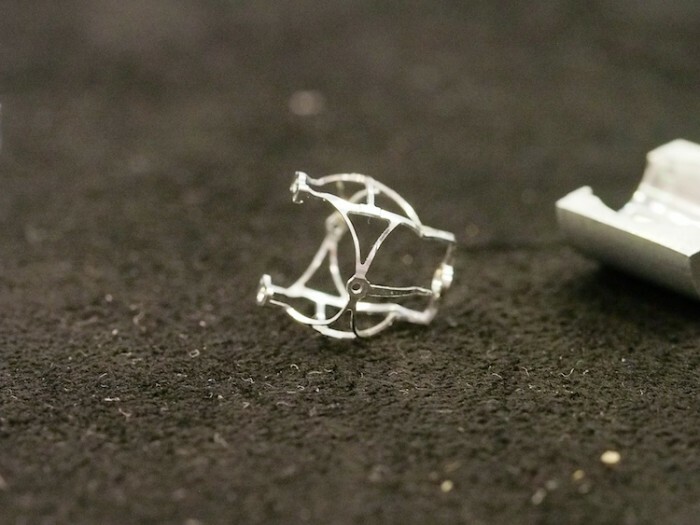 The cages are made from a rod of aluminum on a 5 axis CNC machine –the inner cage rotates once every 24 seconds and the outer rotates once per minute. 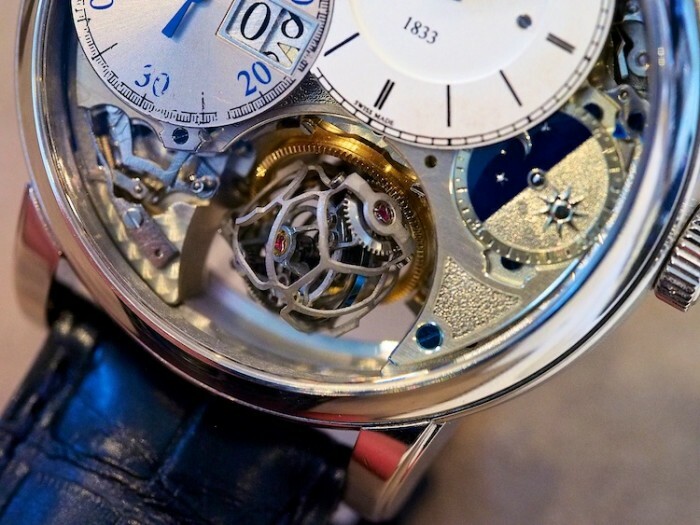 The entire assembly weighs only 0.43 grams, including the heat blued gold balance and blued spherical balance spring. Another crucial operation is that of forming the terminal curves for the spherical balance spring. 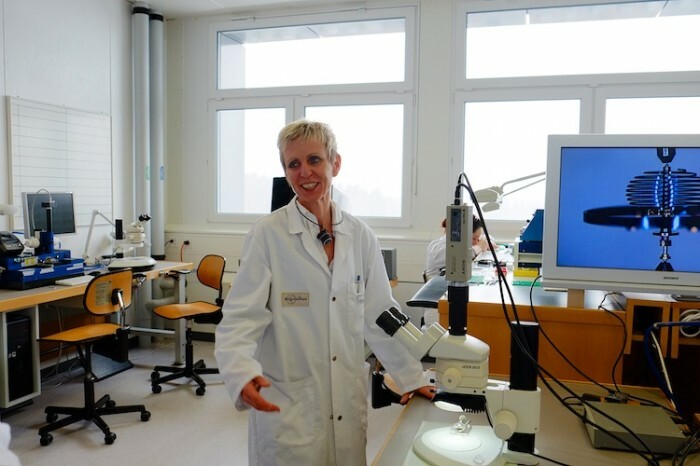 There is exactly one person at the manufacture who is qualified to do so –Ms. Muriel Job, who told us that she “touched my first spring” 20 years ago. She is also responsible for the assembly of the entire oscillator –balance, spring, and balance staff. 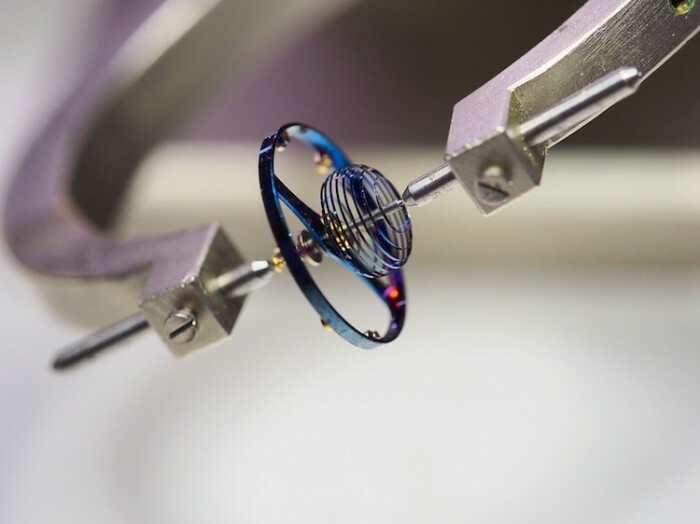 This is difficult for many reasons –for one thing, the finish of the heat-blued 14 carat gold balance means that she can’t use the normal method of making cuts on the underside of the balance to poise it, so instead, both poising and regulation are done with eccentric weights mounted on the balance rim. Despite these challenges, or perhaps because of them, she has infectious energy and enthusiasm for her work and described it to us with great animation. The spherical balance spring was first developed, like the cylindrical balance spring used in the Spherotourbillon and Gyrotourbillon 2, for use in marine chronometers, and like the cylindrical balance spring, the idea was to improve on the benefits of an overcoil –to make the spring “breathe” more symmetrically. A flat balance spring doesn’t do this, and the lateral thrusting motion produced as it vibrates shifts the center of gravity of the entire oscillator system, as well as producing variable friction at the balance staff pivots. Though the spherical balance spring was dismissed as offering no notable advantages by many technical authorities (a 1940s era copy of Britten’s horological dictionary in the Revolution library describes it as a “pure freak”) Jaeger LeCoultre tells us that modern high precision manufacturing methods have enabled them to get distinctly better rate results from their spherical balance spring –the Gyro 3 is claimed to show a maximum deviation in rate of only 0.5 seconds per day. Ms. Job’s task is not an easy one –the terminal curves are not a standard Phillips curve, and each one is formed by laboriously and carefully applying pressure to the end of the spring and then placing it on an optical comparator to see if it matches a template. There’s no rule –on a good day it might go very quickly but on a difficult one, hours might be required, though she says the work is going faster now as she’s becoming more accustomed to the task. Still, staring through a 20x binocular Leica microscope at the balance spring is a vertigo-inducing experience and the mental stress and eyestrain are considerable, and she told us, with some relief, that she’s training someone now to help her. Another task is the application of a special finish to the movement plates and bridges –the “hammered” finish is applied by hand, and we were given a chance to try it ourselves –applying the correct amount of pressure as the tip of the tool pecks, woodpecker like, at the metal surface is quite difficult. 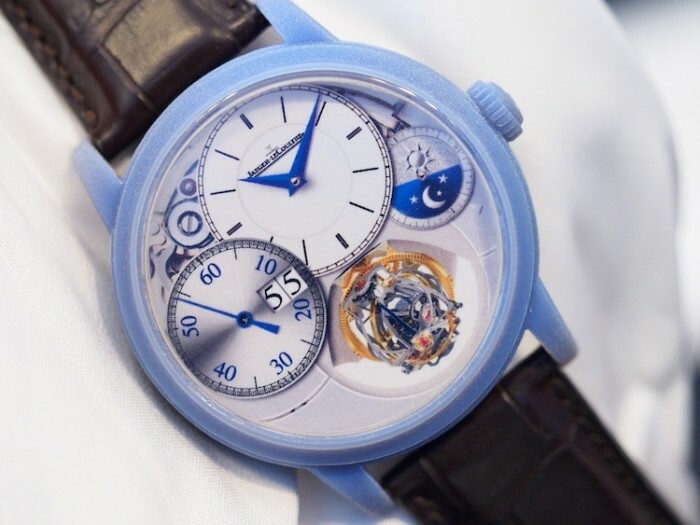 The final watch has a wonderfully harmonious effect that belies its complexity. 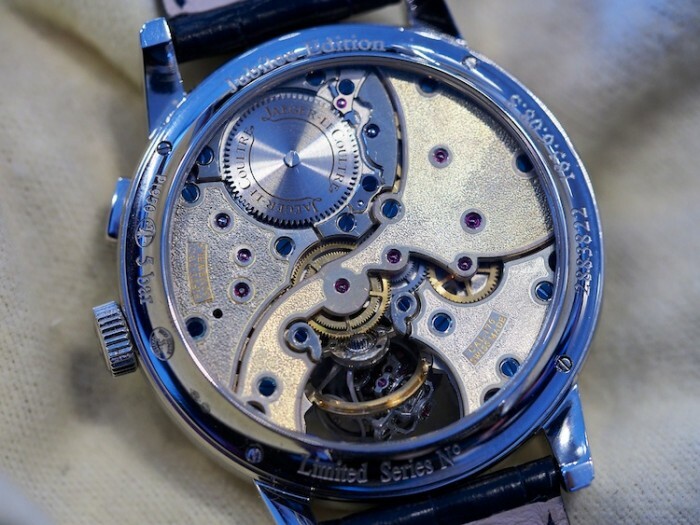 The movement –Jaeger LeCoultre calibre 176 –has a total of 596 parts, with 112 of those going to make up just the tourbillon. 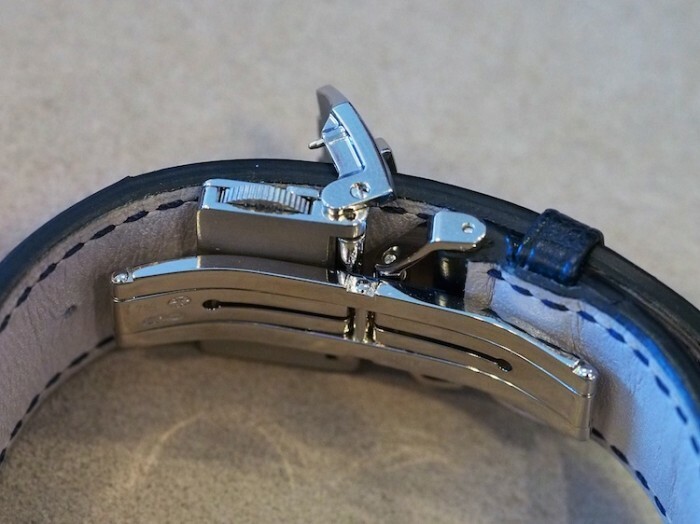 The case and casing-up components add another 42, and the clasp, which has a micro-adjustment mechanism enabling the wearer to adjust the fit in millimeter increments, adds another hundred or so –the clasp, as a matter of fact, has more parts than a lot of watches. 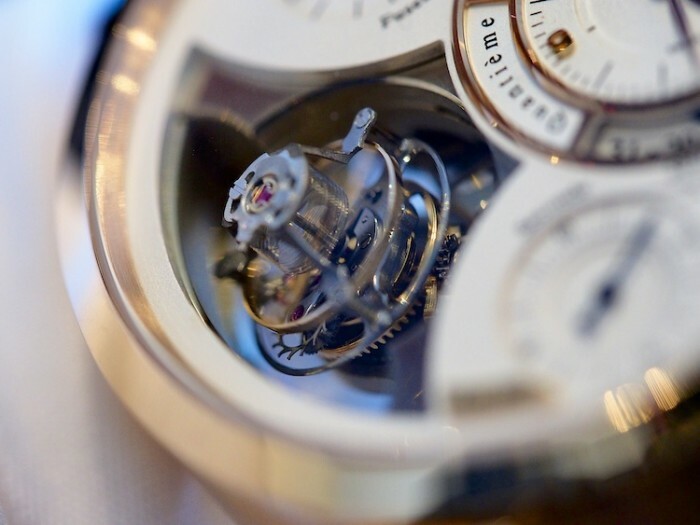 The Gyrotourbillon 3 shown here is the original prototype and as such shows signs of repeated assembly and disassembly; being able to handle and photograph it was a rare experience. We should also note that the finish in the production watch is different –for instance, the aluminum in the production model has a very bright white reflective finish, as opposed to the matte color (we assume the result of oxidation) on the prototype. 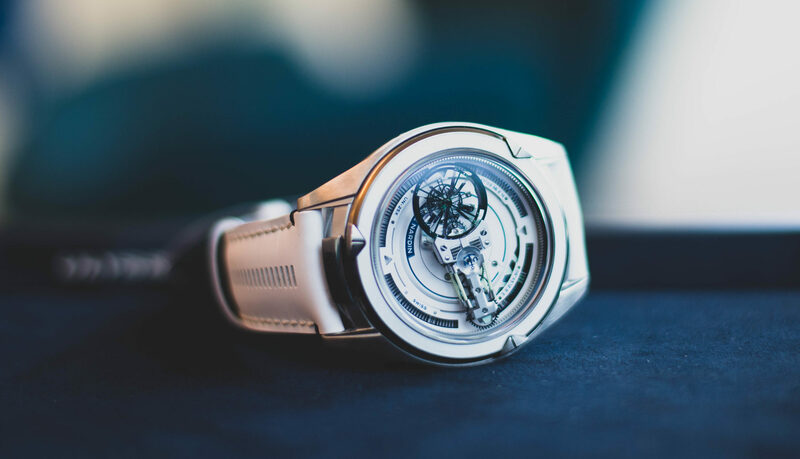 It’s a technically very advanced watch, but to us, what’s really unusual about it is how well integrated are its technical and aesthetic properties. 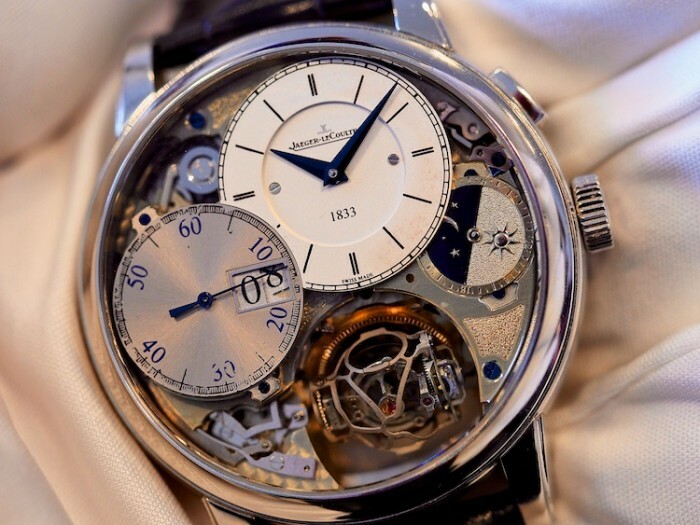 We’ve seen many very complicated watches that, impressive as they were from a purely mechanical perspective, were a bit of a train wreck from a design standpoint; we feel that Jaeger LeCoultre is to be congratulated on how beautifully it’s managed to synthesize these two aspects of a timepiece in the Gyrotourbillon 3. The Hybris Mechanica series is now in its tenth year (the manufacture considers its 2003 Atmos Mysterieux the first Hybris Mechanica timepiece) and international marketing director Stephane Belmont assured me that far from being at an end, the Hybris Mechanica series will continue for the foreseeable future. 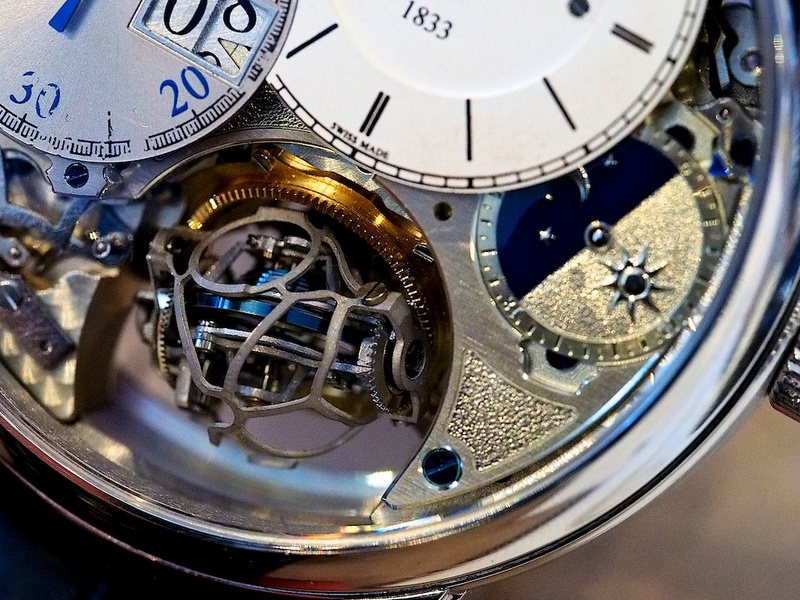 We may not know what’s coming –but Manufacture Jaeger LeCoultre does. 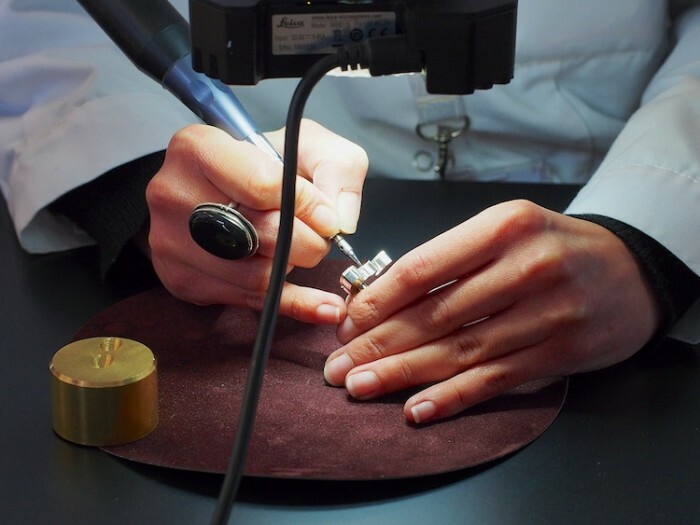 Special thanks to Manufacture Jaeger LeCoultre in Le Sentier and New York for making this story possible. The Hybris Mechanica Gyrotourbillon 3 is a limited edition of 75 pieces in extra white platinum; white gold clasp with micro-fine adjustment.